Aquavar SPD Plus offers higher horse power to meet the demand of the agriculture and irrigation marketplace. Energy Saving – The SPD Plus is a true variable frequency controller which adjusts motor speed to match the hydraulic needs of the system and maintain pressure. Unlike valve controlled systems, the energy draw is substantially reduced during lower flow while operating the pump close to its best efficiency. Up to 70% energy savings over fixed speed pumps can be achieved. Flexible enclosure offerings – NEMA 3R – Outdoor rated enclosures rated to 122F, without derating the drive. NEMA 1 – Indoor rated enclosure providing flexibility for use indoors or mounting within a user supplied enclosure. Load filter for NEMA 1 systems provided separately. Optional Integrated Load Reactor (NEMA 3R only) – The NEMA 3R SPD Plus is available with output filter rated to 1000 feet of motor lead. Programming is also pre-set to 30 Hz minimum to protect motor bearing lubrication required by some motor manufacturers. True Motor Match – The SPD Plus is rated for the higher amp requirements typical of submersible pumps. A 100 HP SPD Plus will run a 100 HP submersible pump! Transducer – As with all Goulds drives, the pressure transducer is included with the drive so there is no need for separate sourcing and compatibility checks. The transducer is pre-wired and tested, with internal case grounding! 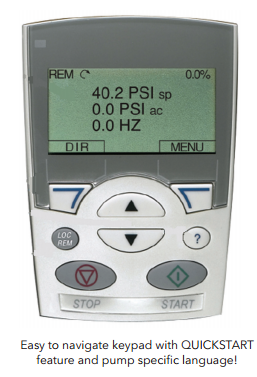 Full Diagnostics – In addition to typical electrical protection and diagnostics, the SPD Plus has a full range of pump protection features such as bound pump or motor shut down, low water or loss of prime shut down. These features require no added input devices. Remote on/off – Permits external control by timers (irrigation), float or pressure switches (tank draining) or manual control. Dry contact closure required. Hand/Auto Option – Allows the drive to be run at full speed without a pressure transducer for the purpose of new well development or system start up. Turning the control back to auto resumes the automatic pressure tracking and control. Pressure Drop – The reaction time o f the drive to pressure drops can be adjusted from the typical 5 PSI drop to as much as 20 PSI. This allows for fewer starts with leaky irrigation systems. 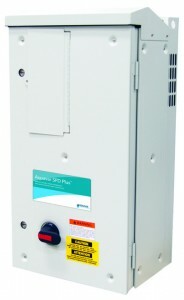 No Water Restart – The SPD Plus has the capability to adjust the time delay in between each “dry well” fault. Adjustable from 10 minutes to 1 hour between each restart. Ideal for low yielding wells.